Carbink in game: 7,563 Who? Important notice! Pokemon Carbink is a fictional character of humans. Carbink (Japanese: ?? 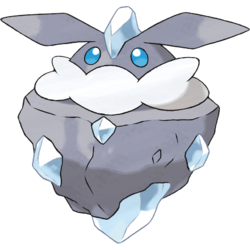 ?— Melecie) is a dual-type Rock/Fairy Pokémon introduced in Generation VI. 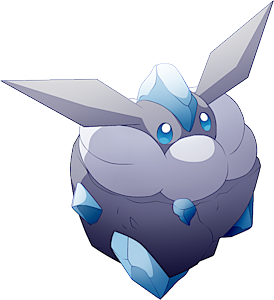 Carbink is born from temperatures and pressure underground, and it has slept for millions of years since its birth. Some have been unearthed during cave excavations. Rarely, Carbink will undergo a strange mutation and transform into Diancie. Three Carbink named Bort, Merrick and Allotrope appeared in Diancie — Princess of the Diamond Domain. 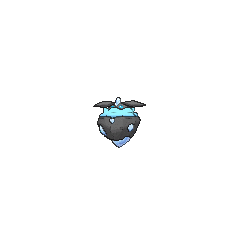 Multiple Carbink including Bort, Merrick and Allotrope and a fourth, leader Carbink named Dace appeared in Diancie and the Cocoon of Destruction. Several Carbink made their main series debut in A Diamond in the Rough!, with one of them causing trouble in Ash's Goodra's homeland. There were many Carbink populating the Diamond Domain in Diancie and the Cocoon of Destruction. 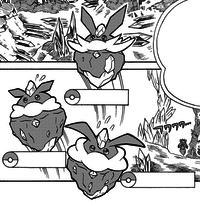 Four Carbink appeared in the Hoopa's Surprise Ring Adventures short In the Dark. Melecie may be a combination of melée (small cut diamonds), ??? mezurashii (rare), and ? ishi (stone).